Ever heard of British Gingerbread? It is a cake flavored with ginger and treacle. 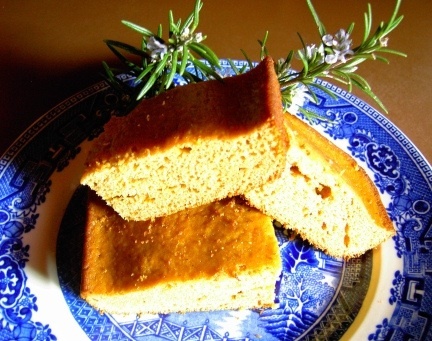 The French equivalent (pain d’epice), whose name means literally “spice bread”, is a cake with a basis of flour, honey and spices. Gingerbread was formerly regarded primarily as a fairground delicacy. Although it is mainly eaten at teatime or at festivals (particularly in Belgium and Germany). Gingerbread (French or English varieties) can easily be made at home. The best results for pain d’epice are achieved with a strong-flavored honey, such as buck-wheat or heather honey. Wheat flour is generally used (sometimes mixed with rye flour); flavorings can include orange flower water, ginger, orange or lemon zest, star anise or cinnamon, or a mixture of spices. For both kinds, orange or apricot marmalade may also be added to the mixture. After baking, the top of the cake may be decorated with pieces of angelica, green walnuts, or candied orange peel. For more information and for recipes visit British Gingerbread.